A water aerobics workout will be one of the most therapeutic and invigorating activities you can do for physical fitness. This refreshing form of movement is also one of the most effective workouts in regards to health benefits achieved. And for those who suffer from arthritic joints or who need rehabilitation from an injury, it can be a lifesaver for remaining physically active in an exercise program. Even if you don’t know how to swim, water aerobics can be done by most anyone. It’s perfect for increasing strength, flexibility, and endurance while reducing stress on joints. What makes working out in water so effective for people with arthritis is the way in which stress is reduced from the joints – when supported by shoulder-depth water your body loses 90 percent of its weight – in waist-high water, about 50 percent. That’s a huge relief on stiff joints making it an ideal form of exercise. Working out in water also creates resistance making it just as intense as some types of exercises on land. Water is constantly flowing and changing directions making resistance in a pool a challenging workout for the body’s muscles. People who work out regularly in water can make significant gains in strength, flexibility, and agility. Unlike traditional weights which require the body to push and pull against the weight plus gravity, water resistance is a more natural resistance requiring the body to strain through the water rather than against it. Being in water requires movement in different directions while adjusting to the push and pull of water. This forces the joints to increase their range of motion adjusting to the motion helping to increase flexibility. When in water our body is not subject to gravity. The buoyancy of water helps take off some of the impact we tend to place on our body due to our own weight. For example, jogging, places a lot of impact on joints due to the pounding of our body against a hard surface. Anyone with joint conditions such as arthritis can greatly benefit exercising in water reducing impact of more wear-and-tear activities. This is why water aerobics is one of the leading forms of therapy for anyone suffering from joint problems. There’s a reason why so many people find being around water relaxing – simply watching water in motion can be one of the most soothing activities helping to relieve stress. This is often why vacations to beaches and island paradises are such popular getaways. Just the act of being in water is soothing, relaxing, and can provide significant reductions in anxiety while improving mood and feelings of peace. The combination of strength and cardio workouts mixed with water resistance in aquatic exercise ensures the body is getting a full workout. Depending on the vigorousness of the workout, a person’s body weight, and water temperature, a person can burn up to 8 to 12 calories a minute. A 45 minute workout in water would potentially burn up to at least 300 to 500 calories. The pressure of being in water actually can work with your blood to help enable blood flow to circulate more effectively in the body which in turn, can help reduce blood pressure and resting heart rate. Water aerobics is not limited to any age group or skill level. As a result, this form of exercise is one of the most popular bonding activities for friends and family. 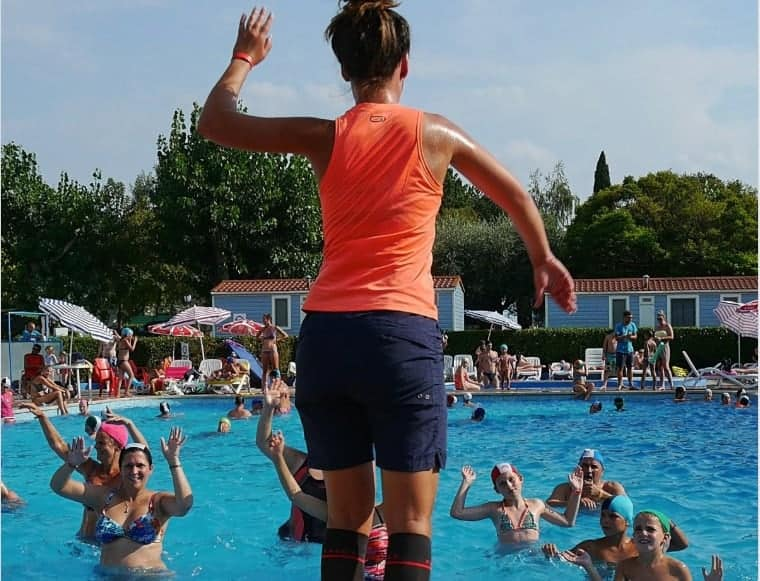 The sport appeals to all ages – with younger generations naturally enjoying the fun in swimming pools while still appealing to older generations and their need to maintain a moderate level of physical fitness. A water workout also boosts endorphin release providing that “feel-good” feeling with you all day long. Water has always been excellent to work in for rehab. The natural buoyancy of the water aids your movements as the water creates a firm pressure on muscles. Because of the viscosity of water, this helps unload the weight experienced by gravity so you can work slowly through almost any type of injury in a completely supported environment. Whether you love being in water or believe you will dread it, once you do a water workout, you will a perfect way to let go and have some fun. You’ll feel lighter in water, you’ll want to experiment with movement, and you’ll feel like a kid again. What better way to get in shape! An excellent water workout is to walk or run in knee-deep water going forwards, backwards, and sideways. Walking at a steady pace for an hour in water could burn as much as 500 calories. Water temperature makes a difference – it it’s too cold (78 degrees or less) then that could aggravate arthritis. If the temperature is above 88 degrees, your heart rate may increase and it is harder to dissipate heat. A temperature zone between 83 to 88 degrees is considered ideal when exercising in water. The nice thing about a water aerobics workout is it doesn’t require much special equipment.Simply wear a swimsuit, or a pair of shorts and a T-shirt. If the water is chilly, a wetsuit or unitard might be a good investment as it provides additional warmth. Nonskid, cushioned soles or “aqua” sandals of rubberized material, is a good idea if the bottom surface of the pool is rough or slick. If exercising in deep water, a flotation belt or vest is also a wise investment. This will help keep your head above water and free your body for constant motion. Unless you have your own private pool, consider joining a gym, health club, or the Y. Ask your doctor or physical therapist for the most convenient location offering water aerobics in the area you live.